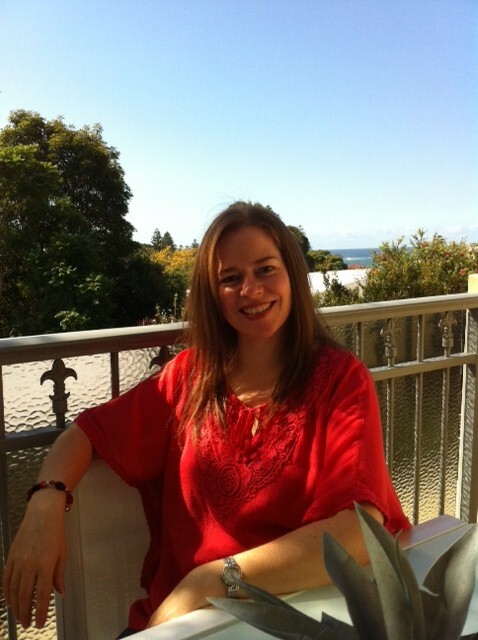 Today it’s with absolute pleasure I welcome debut author Juliet Madison to my My Secret Life segment. Juliet’s first book FAST FORWARD came out only yesterday with Escape Publishing. I can’t quite recall when I first “met” Juliet – although I know the first time I met her in person was at an RWA conferences – but she can probably remember. Why? Cos she doesn’t drink Diet Coke and so her memory is probably a lot better than mine! Anyway, I was lucky enough to read one of her manuscripts in a writing contest and then I “met” her and critiqued the synopsis of FAST FORWARD for her. I absolutely loved the concept and Juliet’s fun and humorous voice shone through even in the synopsis! I cannot wait to read the novel in full! Do You Have The Creative Curse? The desire to be creative is something I can’t escape. Since childhood I’ve been fascinated by the concept of ‘making something out of nothing’; turning a blank page into art, or expressing myself through the written word. I love the inspired energy that comes with it, the creative process, and the rewarding outcome. When I’m being creative, I’m being ME. I’ve always loved a good story so it’s no wonder I discovered a passion for writing fiction myself, even if it did take until my thirties to figure it out! But before then, my creative muse was fed by other means. I still wrote in some form or other throughout my life – poetry got me through the turbulent emotions of adolescence, and I’m pretty proud of my eight year old self’s illustrated short story ‘The Secret Coffin’, but my creative urges resulted mostly in drawings and artworks. You could never leave a blank piece of paper lying around near me, it would soon become a fairy sitting in a magical tree, or a catwalk-worthy fashion design of my own creation (well maybe not catwalk-worthy, but I probably thought so back then!). I don’t draw very often nowadays, but recently tried my hand at creating canvas wall art. 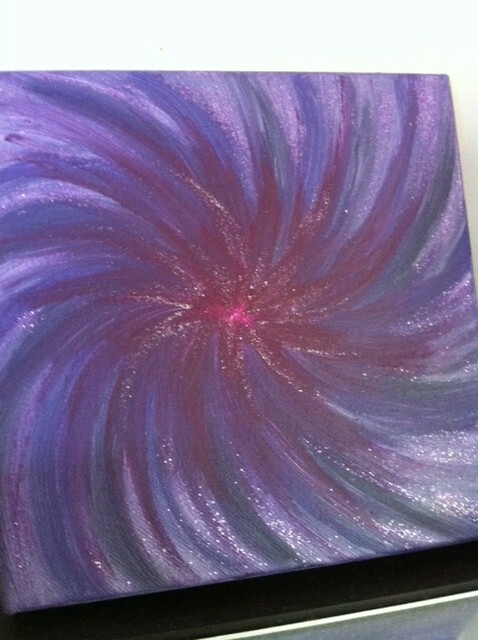 The purpley-red swirling design is titled ‘The Vortex’. I hope to create more wall art when I get the chance, but time seems to be going faster these days and I find myself preferring the creative expression of writing. I love the power of words and the power of the imagination to create characters and weave a story together. Through writing I can experience everything I’ve wanted to experience. I can, in a way, dance through the written word, and create an enriching sensory and emotional experience both for myself and (hopefully) the reader. Some of my characters have creative talents and hobbies too, I can’t help but bring my experience into their lives. I have a character who is a stay-at-home mother trying to find time for drawing and painting and make money from her passion, and I have another character who has a creative gift in playing and composing on the piano. Kelli, the main character in my debut novel FAST FORWARD (just released – yay!) has a creative gift in design that she’s been suppressing ever since a traumatic childhood experience. Through her journey in the story she’ll have to come to terms with her past in order to be the person she was meant to be. Do you have the creative curse? Tell me about the creative pursuits you enjoy or would like to enjoy, and you could win a $50 or $25 Amazon gift card. 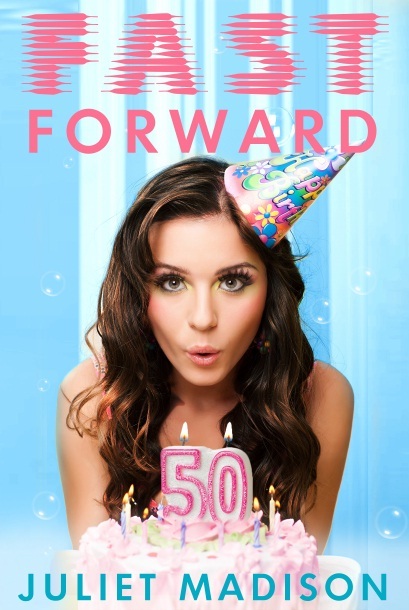 Plus, if you purchase my debut novel FAST FORWARD and forward me the receipt you’ll get an extra entry! Prize: First prize of a $50 Amazon gift card, second prize of a $25 Amazon gift card. Terms: Open worldwide. Winners drawn at the conclusion of Juliet’s February blog tour and notified via email. Winners have one week to respond or new winners will be chosen. Good luck! Thank you Rachael for having me on your blog today! You are ABSOLUTELY welcome Juliet! Everyone be sure to enter Juliet’s contest AND buy Fast Forward because I KNOW it’s going to be an awesome read!! This entry was posted in Uncategorized by rachael johns. Bookmark the permalink. Hi Juliet, so wonderful to see your gorgeous cover out in the world!! And such a fascinating creative life you have lead:) Am so enjoying your secret life series Rach! You have so many wonderful talents! In common with my husband, the creator of the Grand Organ in the Concert Hall of the Sydney Opera House, I love to participate in cultural and artistic endeavours. I wish I was a creative person but so not. I love to sew and cook but need patterns and recipes. I so love creative people to help us less fortunate in that category. Looking forward to reading your book, Fast Forward. Which I bought last night on amazon. Thanks for buying Fast Forward, Shari. And I reckon sewing is still creative even if you use a pattern – I’m hopeless at sewing! HI Juliet – congratulations on the release of Fast Forward. Dancing in front of the mirror to Madonna featured heavily in my adolescence. I went on to promote one of her concert tours in the early nineties (didn’t get to meet her unfortunately, but sat in the VIP section at Wembley Stadium). I loved dancing as a kid but my mother insisted I study music not dancing. I’ve been a frustrated, untrained ballerina every since. But I can play Bach, Beethoven and Mozart if pushed. Hope Fast Forward sells like crazy!! Why am I not surprised you would be promoting Madonna and sitting in the VIP section in London?? You’re a star!!!!! Juliet, congrats on your debut release. Fast Forward sounds like a fun read. 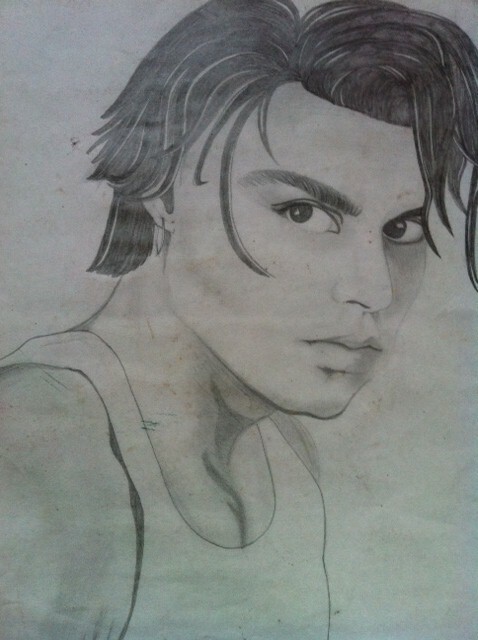 I also liked dabbling in drawing and painting in my younger years. More recently I did a mixed media course which was great fun. I wish I had more time nowadays for art. Thanks Coleen. It’s fun to be creative, I wish I had more time for art too! LOL to the diet coke reference Rachael! But for some reason I can’t seem to remember ‘exactly’ when we met. It’s like we’ve just always known each other! I do remember you from twitter and Romaus though, so must have grown from there, and of course meeting in person at RWA conference. Thanks for hosting me today, I enjoyed raving on about my creative curse! OK, now I officially hate you 🙂 I already knew you were gorgeous, a talented writer and the nicest person – and now I find out you can draw AND dance! Hmmppfff! Hi Juliet, just bought your book and loving the cover! I remember it from one of the pitch competition’s for entangled – it stuck in my brain! Looking forward to reading it! Thanks everyone for commenting on Juliet’s blog – I’m so in awe of her talent!! Blogging is about as creative as I get! I do try and make cards but it really isn’t my passion. I enjoy doing it in a group of people but don’t often get all the stuff out at home despite the fact that I have spent a lot of money on equipment over the years! I don’t think I have the creative curse but you definitely do! 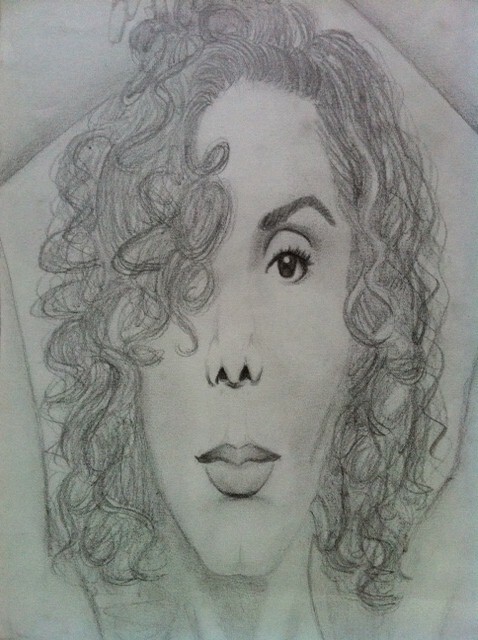 It is amazing how multi talented you are, the drawings are awesome. I enjoy hearing mire about an authors life and interests. Don’t give up your art either! the book sounds fun and interesting. Thanks for the giveaway. I love writing and cooking, and once in a while I’ll try painting or drawing (though I’m not great at that). Creativity is definitely a siren call! Sounds like you have a lot of creative interests! Sewing is a great skill to have, I was never much good at it. My son loves making picture edits on the computer too!